Product #60553 | SKU RS-01-A7 | 0.0 (no ratings yet) Thanks for your rating! The Tilta Sony a7/a9 Series Run/Stop Cable for Wooden Handle 2.0 (35.6cm) is used to connect a right-side Tilta Wooden Handle 2.0 to a Sony a7/a9 Series camera. The cable is designed with one seven-pin LEMO-type connector (right angle) and one micro-USB connector (straight). 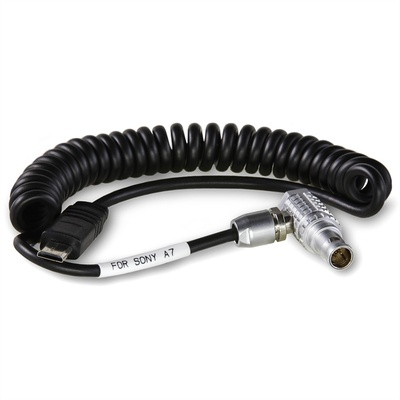 This coiled cable will trigger the run/stop function on the camera.